Why make Precision Saw and Tool your sharpening company? Since 1986 we have offered friendly, prompt, professional service and FREE delivery to surrounding areas. We offer an array of sharpening services, from your big company to your small hobbyist. We offer years of experience on all of our services. 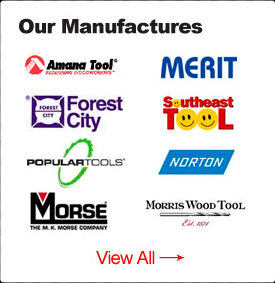 We also work side by side with a wide host of manufacturers and their products like; Amana Tools, Popular Saw Blades, Norton Abrasives, Wisconsin Knife, Forest City Tools, W.L. Fuller and Porter Cable Tools. Precision Saw and Tool is here to help you with your tooling needs. Our sharpening is done on some of the world’s premier sharpening machines such as the Vollmer CNC machine to ensure quality and accuracy. We look forward to earning your business and providing quality service for many years to come. Fill out this brief form and we will get back to as soon as possible.